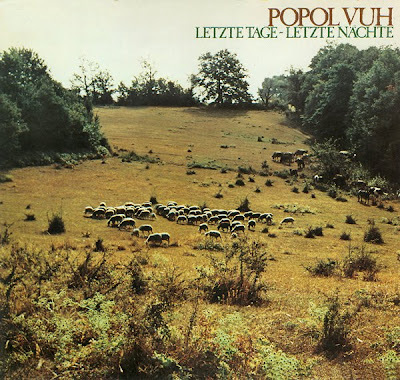 I had originally thought the good Popol Vuh discography ended with what I had explored: Affenstunde, In Den Gärten Pharaos, Hosianna Mantra, Einsjäger & Siebejäger, Aguirre, and the Nosferatu soundtrack. Little did I know there were a couple of other gems interspersed there, Das Hoheleid Salamos, their "non-official" album of Indian Classical music appropriately titled Yoga, and this. Definitely one of their essential albums, really part of their peak material while they were still working with Djong Yun and creating spiritual, orchestral, pastoral rock music. Letze Tage - Letze Nächte is heavier on the sheer rock vibe, the sound here is closer to their soundtrack to Fitzcarraldo, the usual spiritual raga/modal ascents and descents molded into epic sturm & drang. Uplifting and energizing.